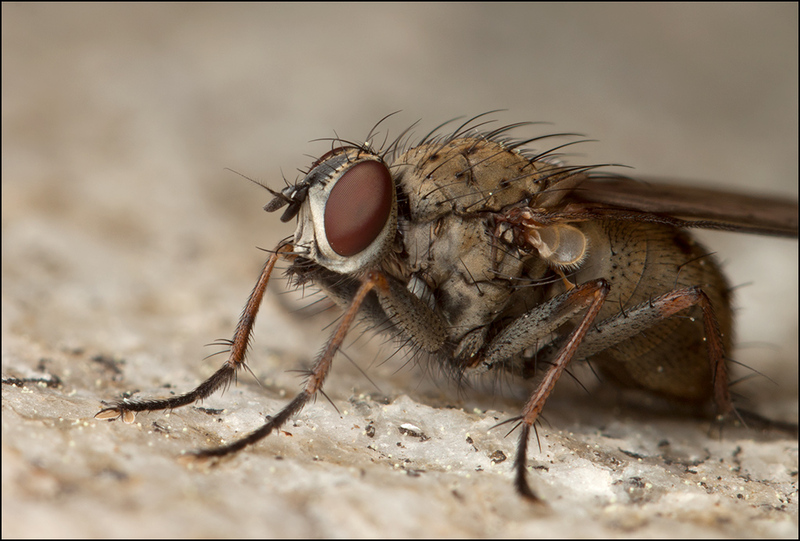 Just your basic fly on a rock, photographed to help familiarize myself with a new setup. Shot as 6 frames handheld stack, Canon T1i with Canon 100mm f/2.8L USM macro on 68mm of Kenko tubes, Canon Speedlite 580EX II with 4" x 5" Opteka diffuser at end of lens, 1/250 second at f/9 nominal (about f/26 effective at 1.9X magnification), E-TTL exposure. Processed as Zerene Stacker DMap, no retouching. The first image is about 75% of the width of the original frame, so about 8.8 mm field width as shown here. The second image is resized to 50% of actual pixels. Because of the f/26 effective, there's not much detail below here, and even this is pretty strongly sharpened. I'm about to upgrade my 100mm to the IS USM L version. 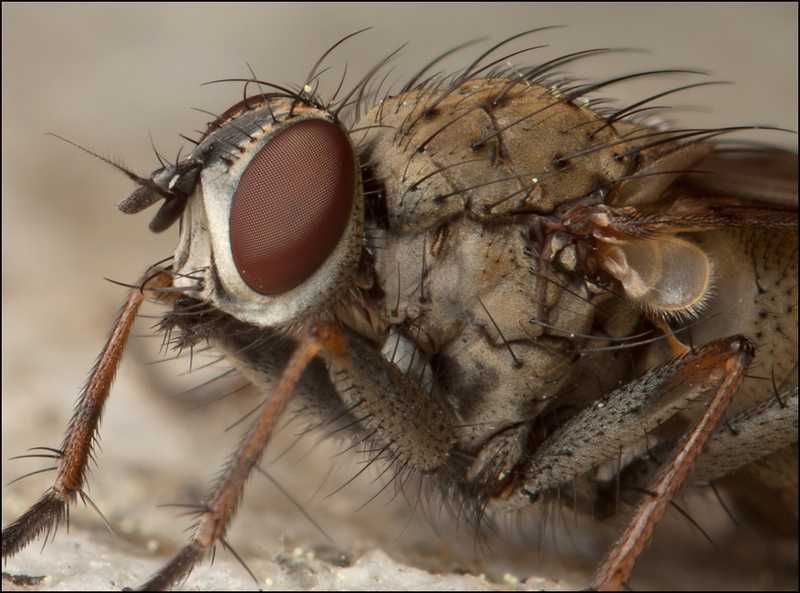 Have you found the IS to be of particular benefit for handheld macro? Any reason why you went with the Kenko tubes as opposed to a Raynox diopter? The IS definitely does work for macro, but I have not shot enough to have much feeling for it. The image in the viewfinder certainly jumps around a lot less when it is engaged. I used tubes for this only because I had already tested with tubes and knew that the quality held up OK at this magnification. The ranges of subject sizes are very similar. With the 68 mm tubes, I get about 35 mm to 11.5 mm field width. With the Raynox DCR-250, it is about 28 mm to 11 mm. In quick tests just now at closest focus, tubes seem to give a slightly sharper and more contrasty image, with noticeably less lateral CA. Photoshop CS5 Lens Correction filter nicely removes the CA in both cases, leaving only some difference in sharpness. The difference is evident in side-by-side comparisons, but they both look pretty good. At 28 mm field width, the edge resolution is far better using the 100 mm alone at a close focus, than by setting the 100 mm at infinity focus and adding either extension or the Raynox DCR-250. You should definitely not use these additions if the 100 mm by itself can reach the desired magnification. At magnifications that the 100mm will not quite reach on its own, I would add tubes but keep the 100mm with its ring set to closest focus or near to it. Edit 3/28/2015 to clarify the last paragraph.